جلسه هشتم.  اولين ابزار ذخيره سازي اطلاعات بصورت مغناطيسي در سال 1978 توسط شرکت Seagate تحت استاندارد ST506 به بازار عرضه کرد. 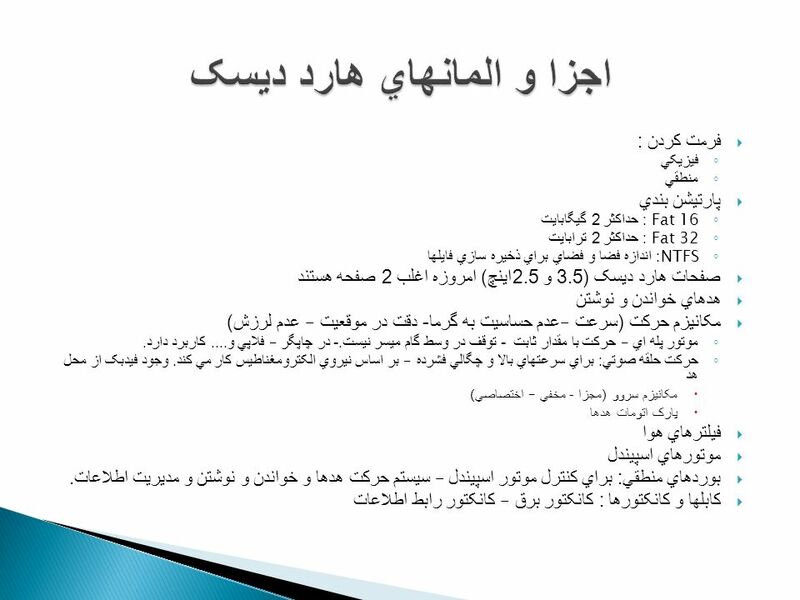 اين استاندارد بلافاصله. 8  توجه به نوع کابل  توجه به نوع وسيله و Master يا Slave بودن آن ( ست کردن آن )  اگر کابل 80 رشته اي است از حالت CS استفاده نکنيد  دقت در نصب کابلها و توجه محل نصب آنها  سيم قرمز کابل IDE به سمت کابل برق باشد  تنظيم شناسايي IDE ها بصورت Auto توصيه مي شود. 10 tracks  Information is recorded in a circular fashion in what are called tracks. 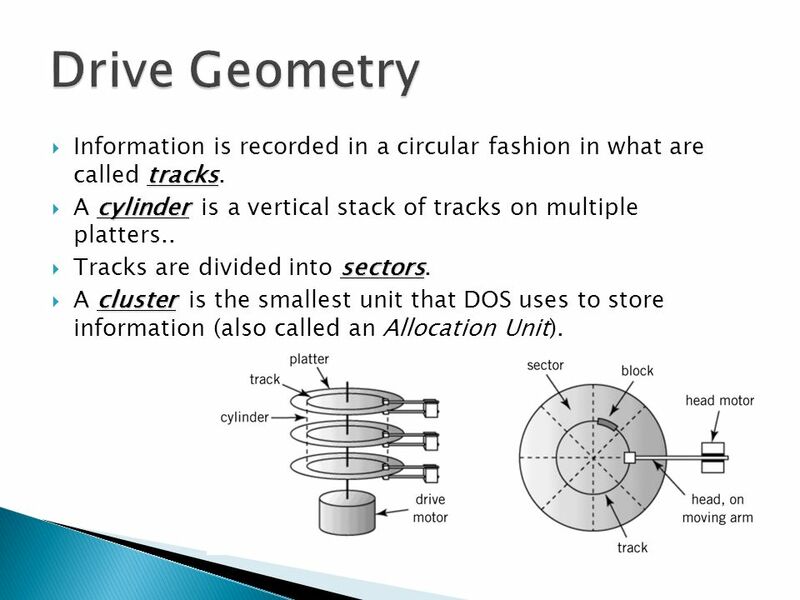 cylinder  A cylinder is a vertical stack of tracks on multiple platters.. sectors  Tracks are divided into sectors. 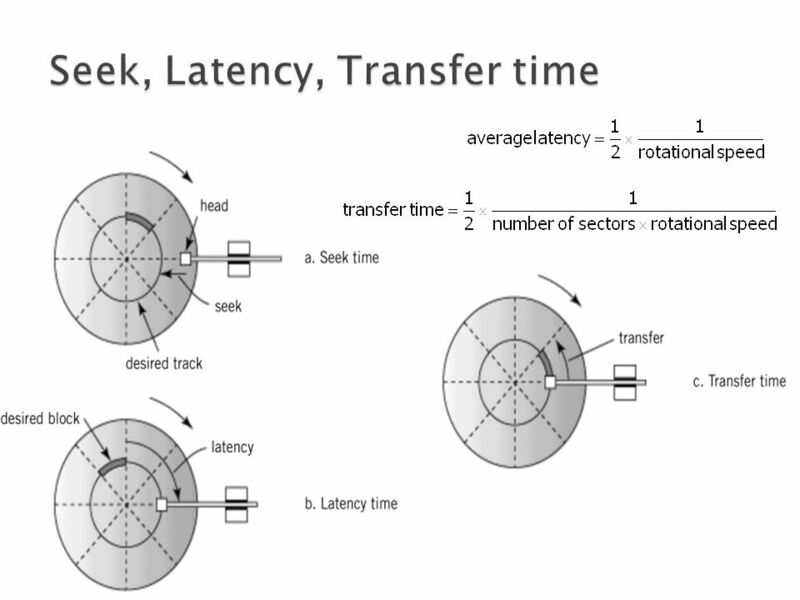 cluster  A cluster is the smallest unit that DOS uses to store information (also called an Allocation Unit). 14 1. Low level formatting (LLF) ◦ This is the "true" formatting process for the disk. 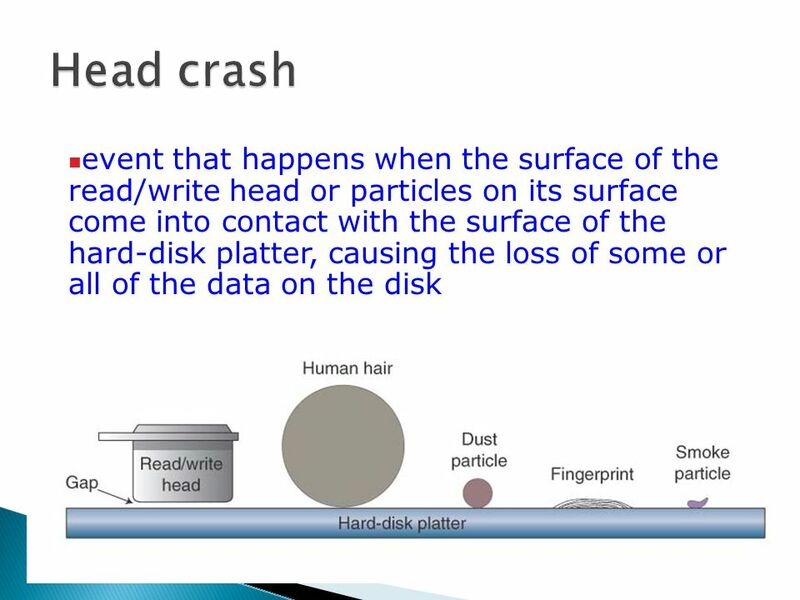 ◦ It creates the physical structures (tracks, sectors, control information) on the hard disk. ◦ Normally, this step begins with the hard disk platters "clean", containing no information. 2. Partitioning ◦ This process divides the disk into logical "pieces" that become different hard disk volumes (drive letters). ◦ This is an operating system function. 3. High level formatting (HLF) ◦ This final step is also an operating-system-level command. ◦ It defines the logical structures on the partition and places at the start of the disk any necessary operating system files. 17  قابليت اعتماد – MTBF بين 300000 تا 800000 ساعت است. 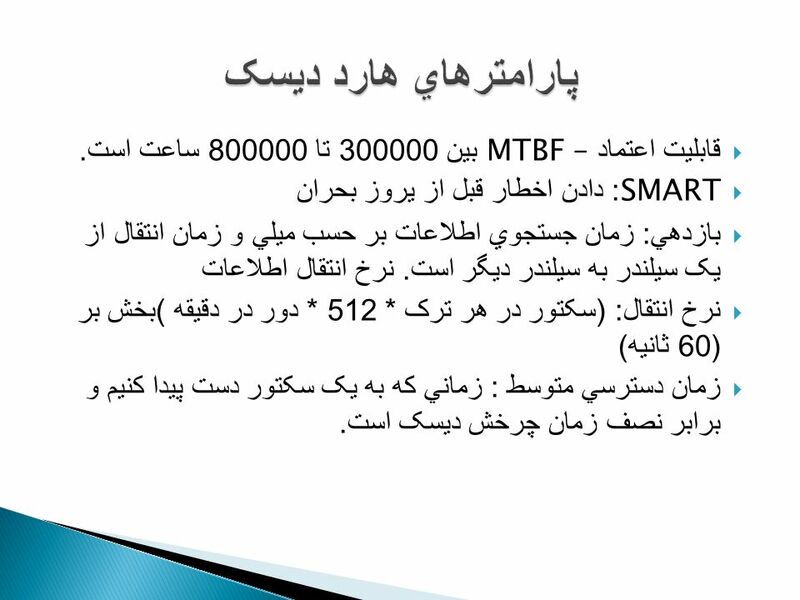  SMART: دادن اخطار قبل از يروز بحران  بازدهي : زمان جستجوي اطلاعات بر حسب ميلي و زمان انتقال از يک سيلندر به سيلندر ديگر است. نرخ انتقال اطلاعات  نرخ انتقال : ( سکتور در هر ترک * 512 * دور در دقيقه ) بخش بر (60 ثانيه )  زمان دسترسي متوسط : زماني که به يک سکتور دست پيدا کنيم و برابر نصف زمان چرخش ديسک است. 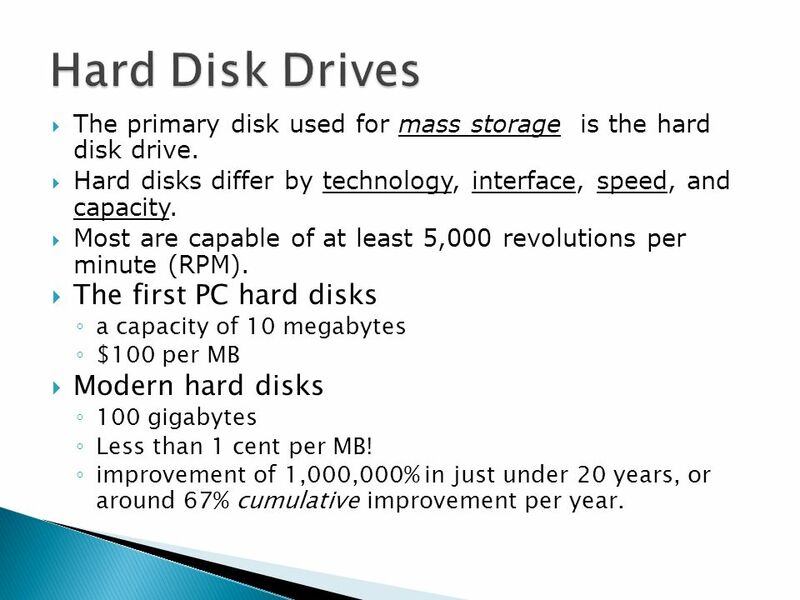 20  The primary disk used for mass storage is the hard disk drive. 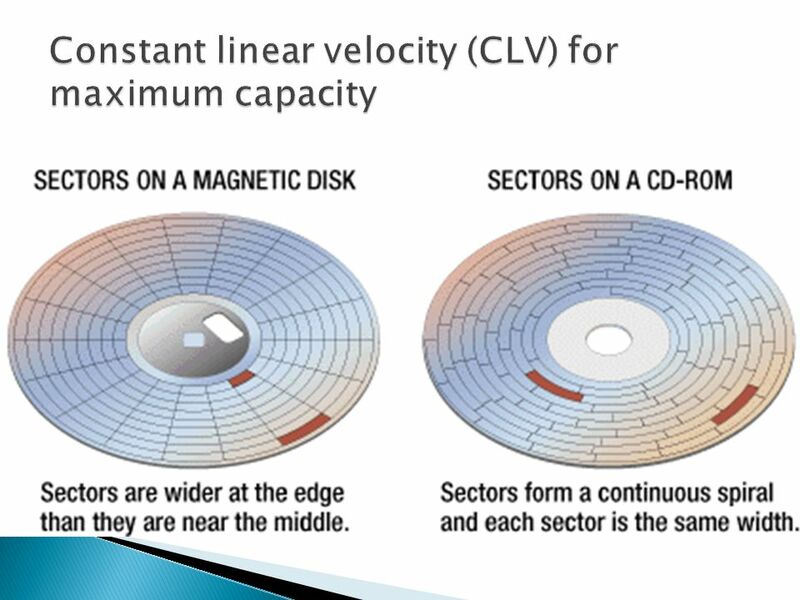  Hard disks differ by technology, interface, speed, and capacity. 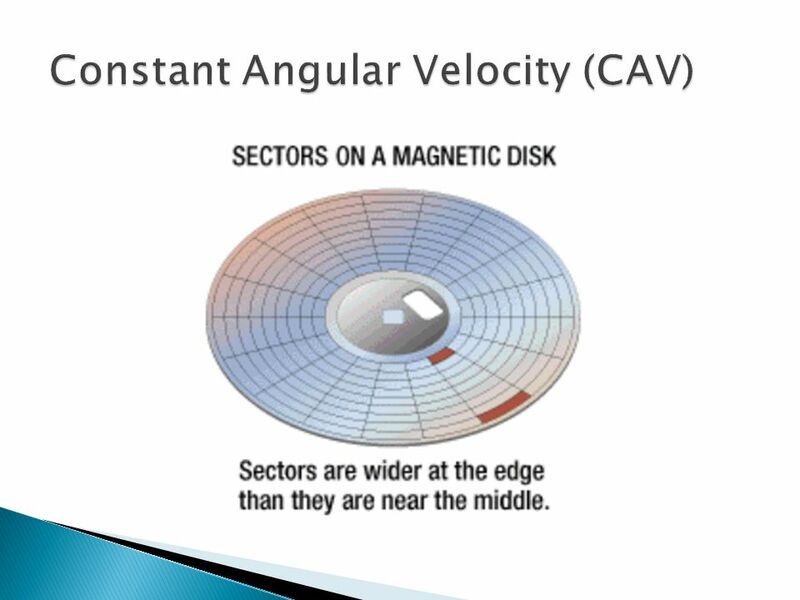  Most are capable of at least 5,000 revolutions per minute (RPM).  The first PC hard disks ◦ a capacity of 10 megabytes ◦ $100 per MB  Modern hard disks ◦ 100 gigabytes ◦ Less than 1 cent per MB! ◦ improvement of 1,000,000% in just under 20 years, or around 67% cumulative improvement per year. 25  AT Attachment ◦a disk drive implementation that integrates the controller on the disk drive itself. 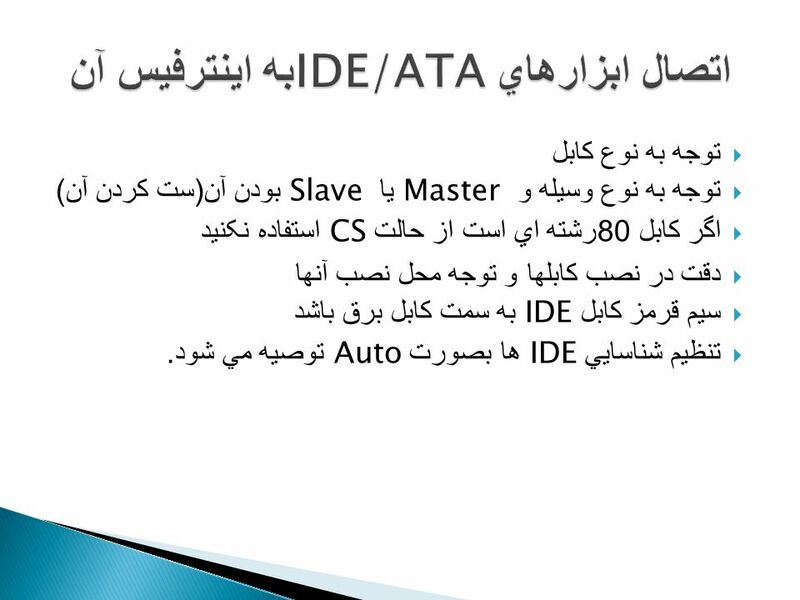  ATA and IDE are the same thing, with an interface that is 16 bits wide to match the old AT bus. master slave  The specification calls for a single channel, shared by two devices that are configured as master and slave. 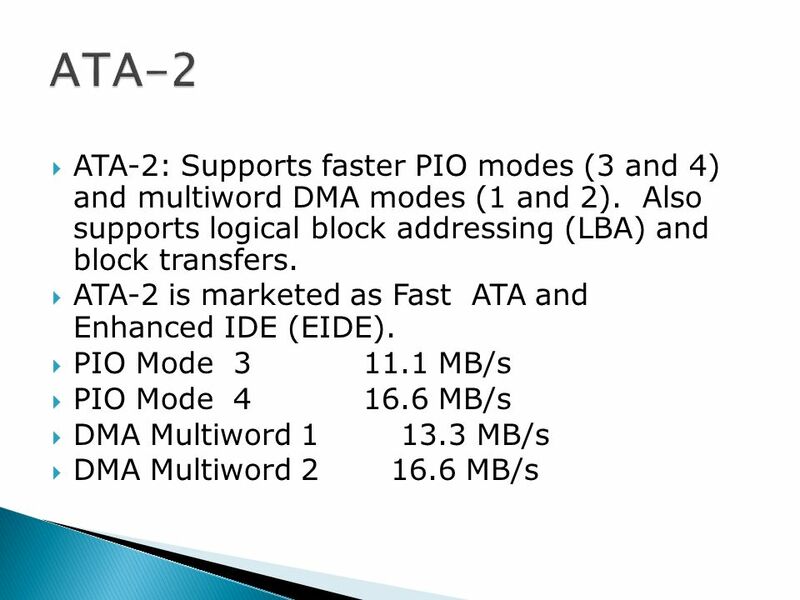  ATA includes support for PIO modes 0, 1 and 2  ATA includes support for single word DMA modes 0, 1 and 2, and multiword DMA mode 0. 26 The only practical difference is that the PC will assign drive letters to the master drive before the slave drive, so that if you have a master and slave on the primary IDE channel and each has only one regular, primary partition, the master will be "C:" and the slave "D:". 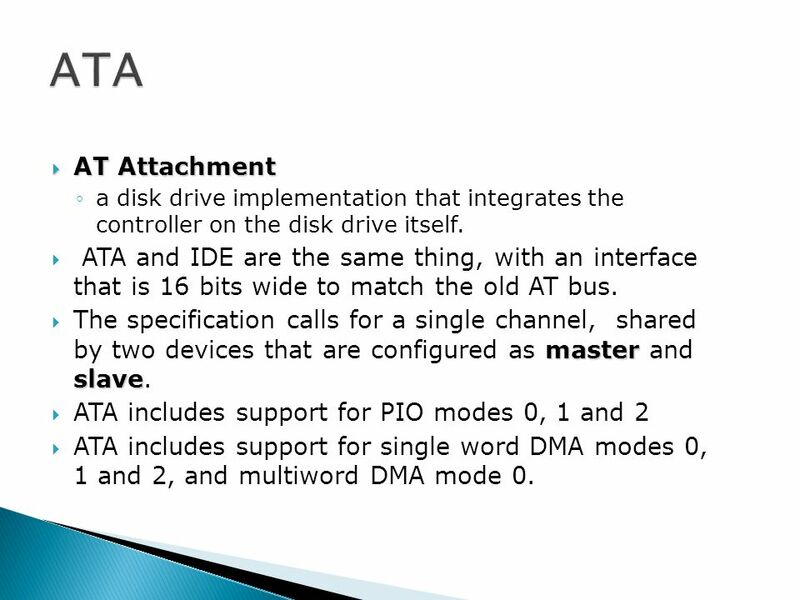 This means that the master drive (on the primary channel) is the one that is booted, and not the slave. 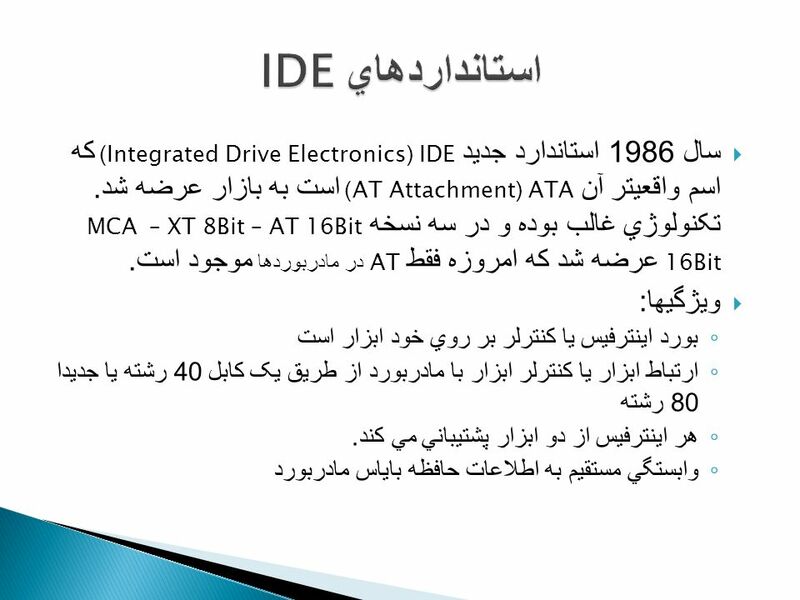 27  A newer version of the IDE mass storage device interface standard developed by Western Digital Corporation. ◦It supports data rates of between 4 and 16.6 MBps, about three to four times faster than the old IDE standard.  It can support mass storage devices of up to 8.4 gigabytes, whereas the old standard was limited to 528 MB. 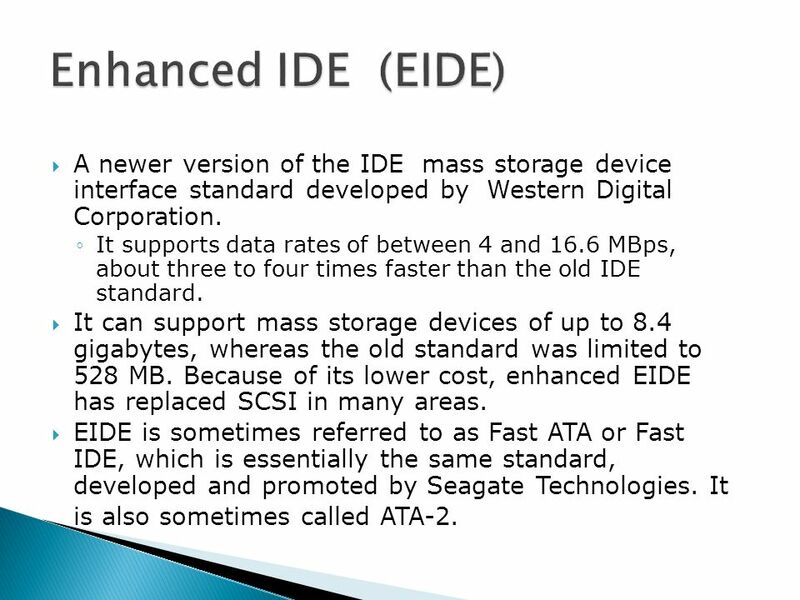 Because of its lower cost, enhanced EIDE has replaced SCSI in many areas.  EIDE is sometimes referred to as Fast ATA or Fast IDE, which is essentially the same standard, developed and promoted by Seagate Technologies. 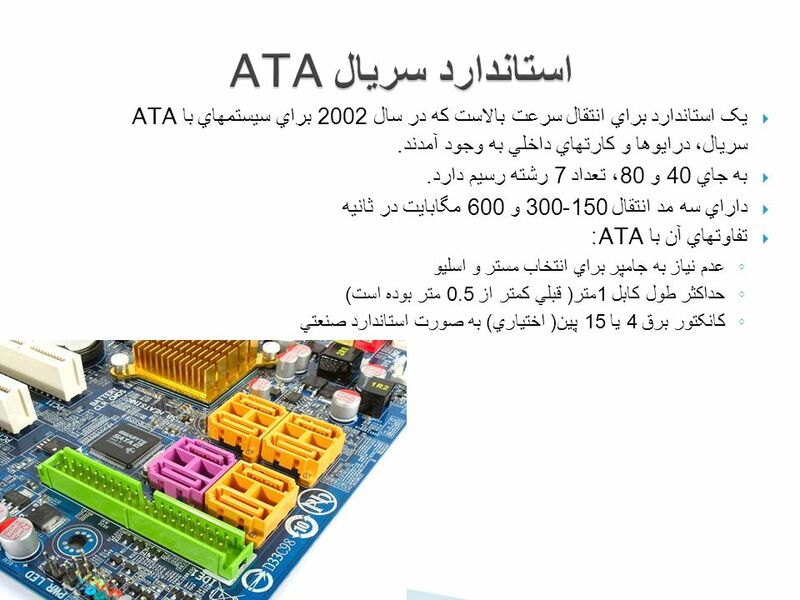 It is also sometimes called ATA-2. 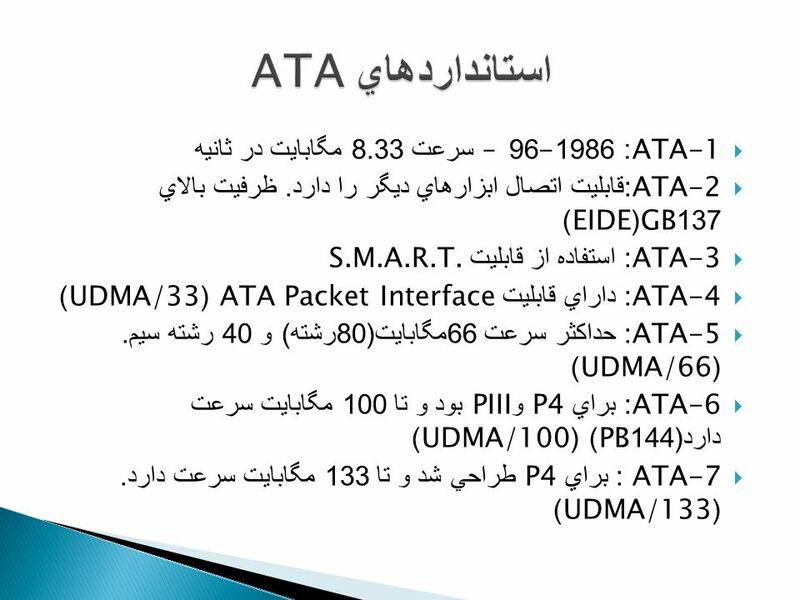 29  The newest version of the AT Attachment (ATA) standard, which supports burst mode data transfer rates of 33.3 MBps.  To take advantage of these high speeds, your computer must also be equipped with Ultra DMA, a protocol that supports faster data transfer rates to and from hard disk drives.  UDMA is a more advanced technology which provides for even faster throughput, up to 33.3 MB/s in UDMA mode 2 and 66.7 MB/s in UDMA mode 4, twice to four times that of EIDE, for much lower prices than SCSI. Many new computers come with large UDMA drives and UDMA interfaces, and it's possible to add a UDMA interface card (such as the Promise Ultra33 or Ultra66) to an existing system to boost speed, even on older non-UDMA drives. 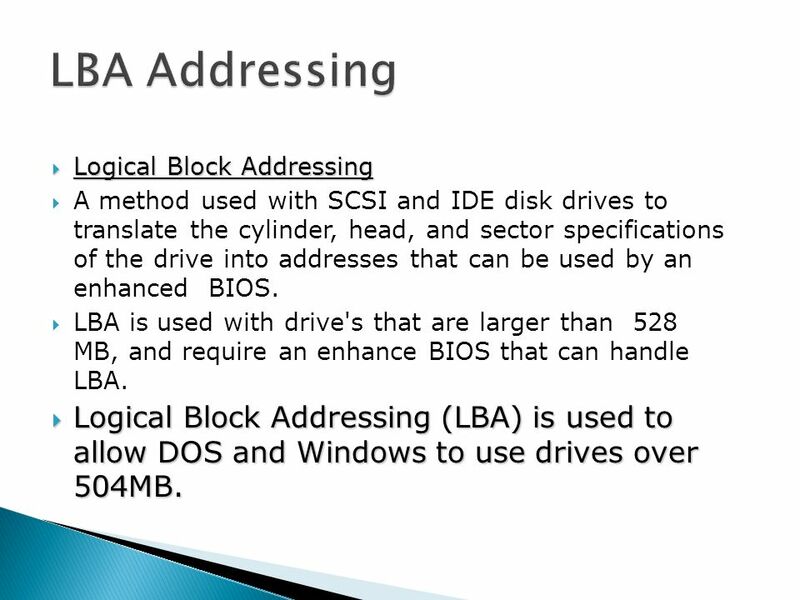 30  Logical Block Addressing  A method used with SCSI and IDE disk drives to translate the cylinder, head, and sector specifications of the drive into addresses that can be used by an enhanced BIOS.  LBA is used with drive's that are larger than 528 MB, and require an enhance BIOS that can handle LBA. 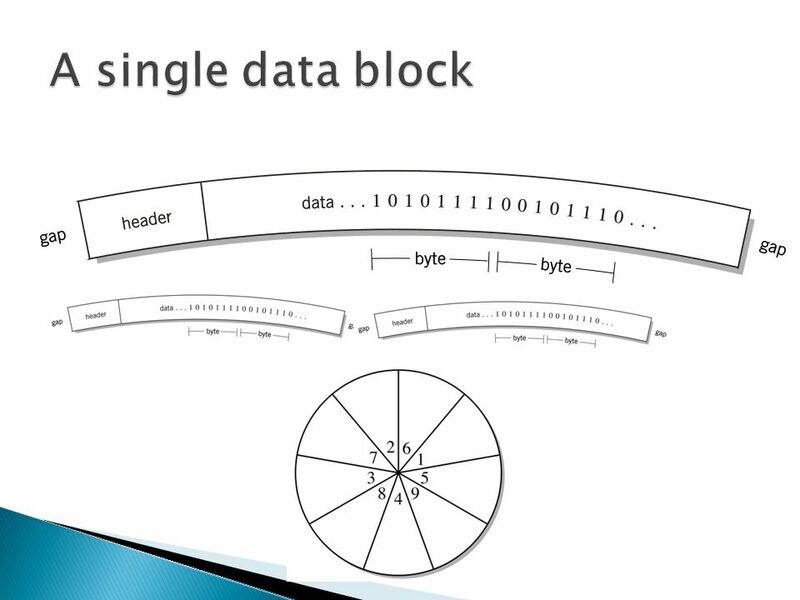  Logical Block Addressing (LBA) is used to allow DOS and Windows to use drives over 504MB. 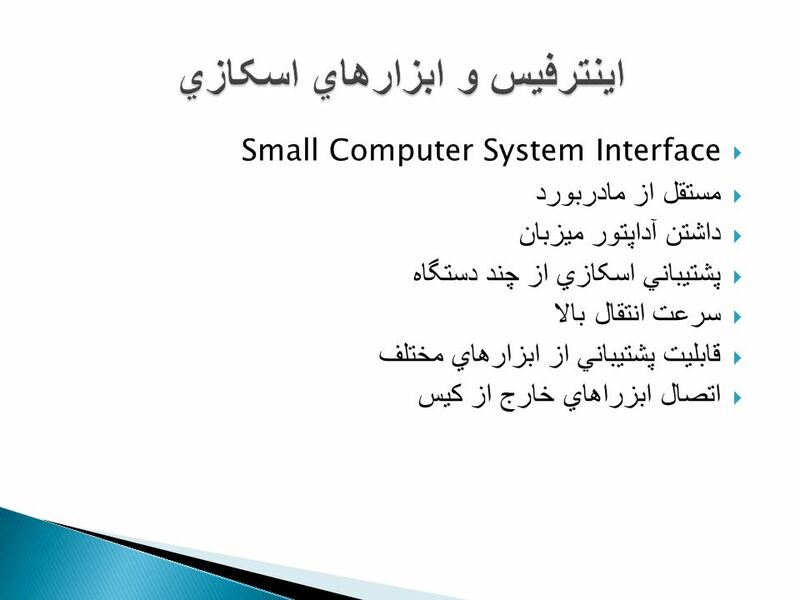 31  Small Computer Systems Interface  Small Computer Systems Interface, a standard developed by the American National Standards Institute (ANSI). 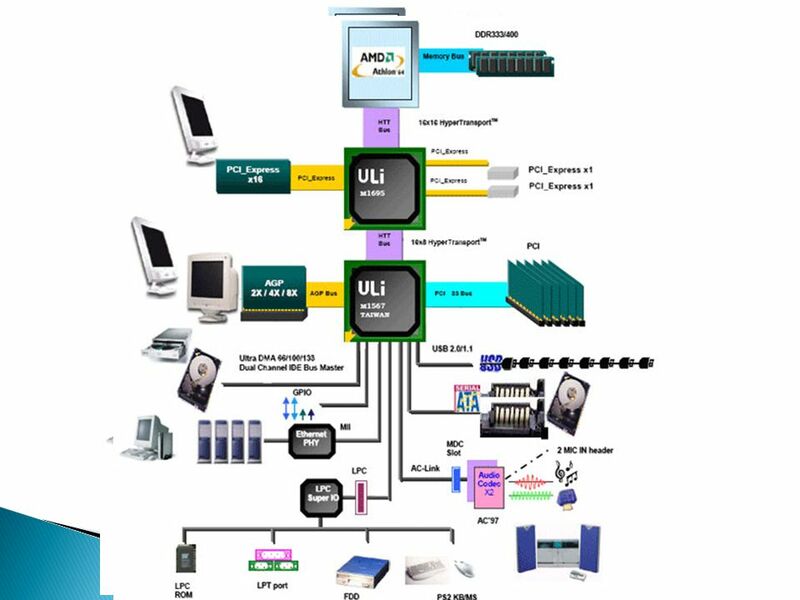  It specifies a universal, parallel, system-level interface for connecting up to eight devices (including the controller) on a single shared cable (called a SCSI bus). 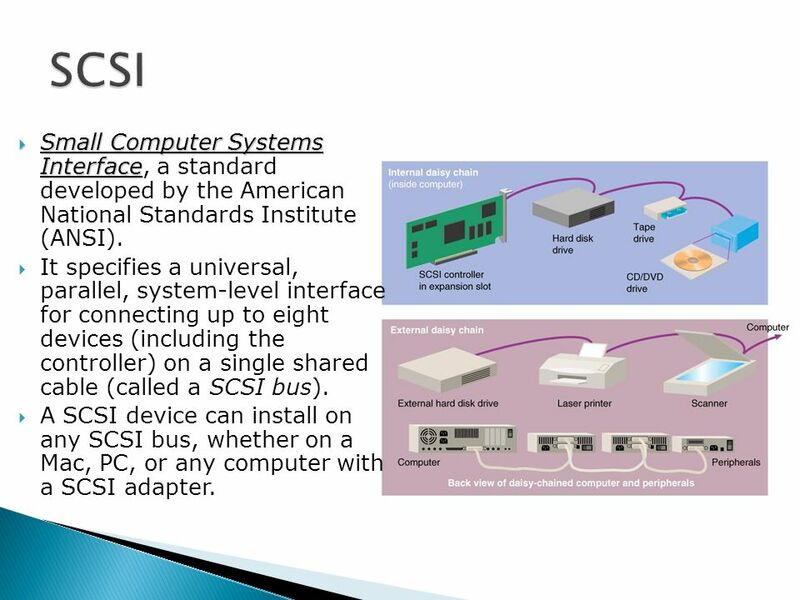  A SCSI device can install on any SCSI bus, whether on a Mac, PC, or any computer with a SCSI adapter. 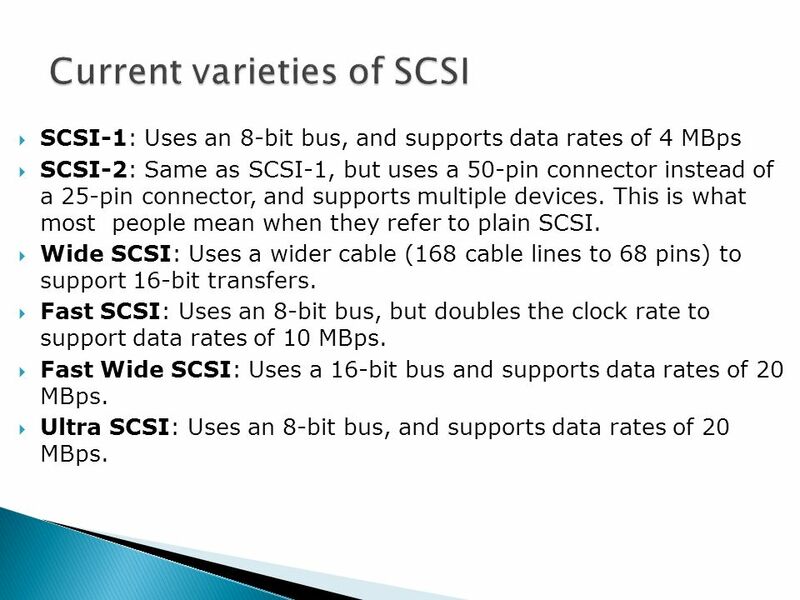 32  SCSI-1: Uses an 8-bit bus, and supports data rates of 4 MBps  SCSI-2: Same as SCSI-1, but uses a 50-pin connector instead of a 25-pin connector, and supports multiple devices. This is what most people mean when they refer to plain SCSI.  Wide SCSI: Uses a wider cable (168 cable lines to 68 pins) to support 16-bit transfers.  Fast SCSI: Uses an 8-bit bus, but doubles the clock rate to support data rates of 10 MBps.  Fast Wide SCSI: Uses a 16-bit bus and supports data rates of 20 MBps. 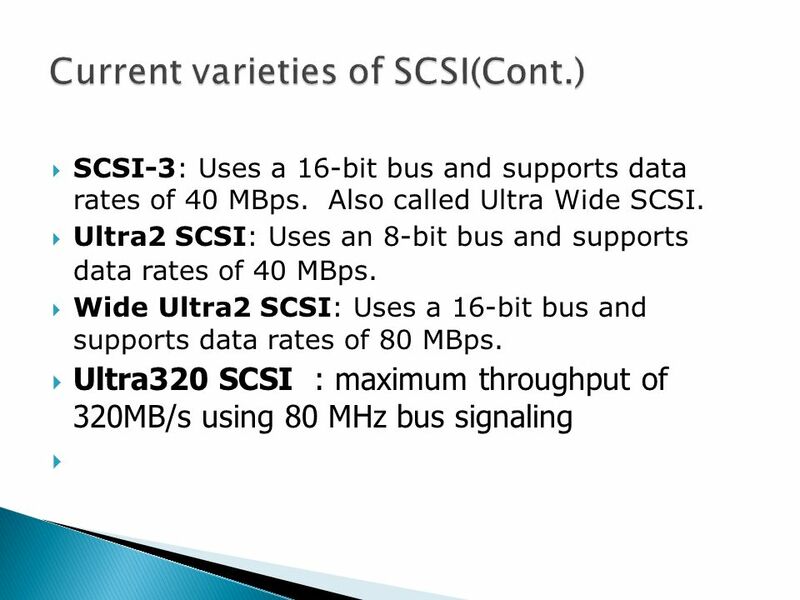  Ultra SCSI: Uses an 8-bit bus, and supports data rates of 20 MBps. 35 1. 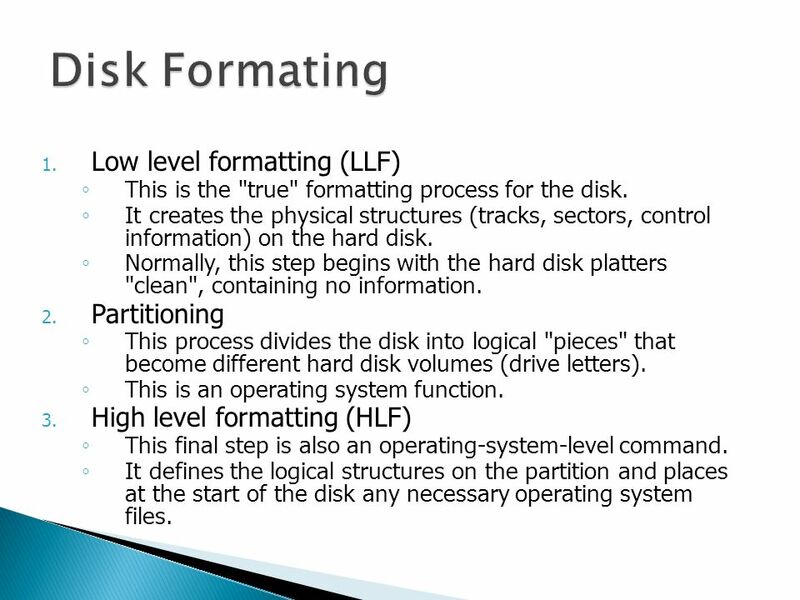 Low level formatting (LLF) ◦ This is the "true" formatting process for the disk. 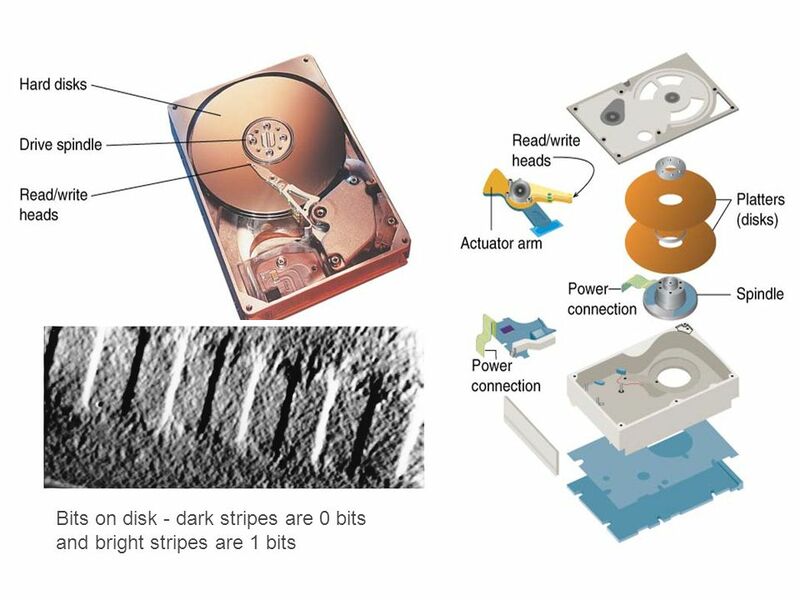 ◦ It creates the physical structures (tracks, sectors, control information) on the hard disk. ◦ Normally, this step begins with the hard disk platters "clean", containing no information. 2. Partitioning ◦ This process divides the disk into logical "pieces" that become different hard disk volumes (drive letters). ◦ This is an operating system function. 3. High level formatting (HLF) ◦ This final step is also an operating-system-level command. ◦ It defines the logical structures on the partition and places at the start of the disk any necessary operating system files. Download ppt "جلسه هشتم.  اولين ابزار ذخيره سازي اطلاعات بصورت مغناطيسي در سال 1978 توسط شرکت Seagate تحت استاندارد ST506 به بازار عرضه کرد. اين استاندارد بلافاصله." 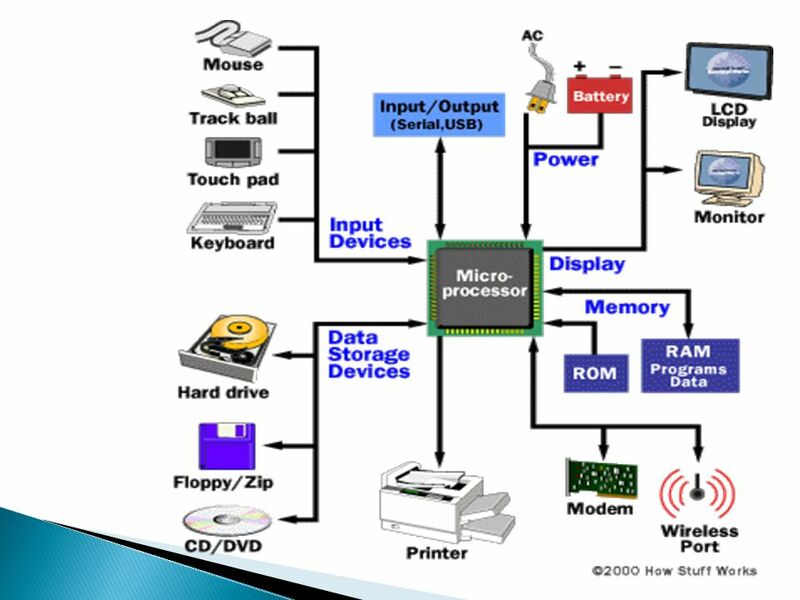 Secondary Storage Input Output Processing Internal Memory. Hard Disk Drives Chapter 7. مهدی آذرنوش مبحث ششم : آرایه ها و رشته ها حسابگری الگوریتمی. 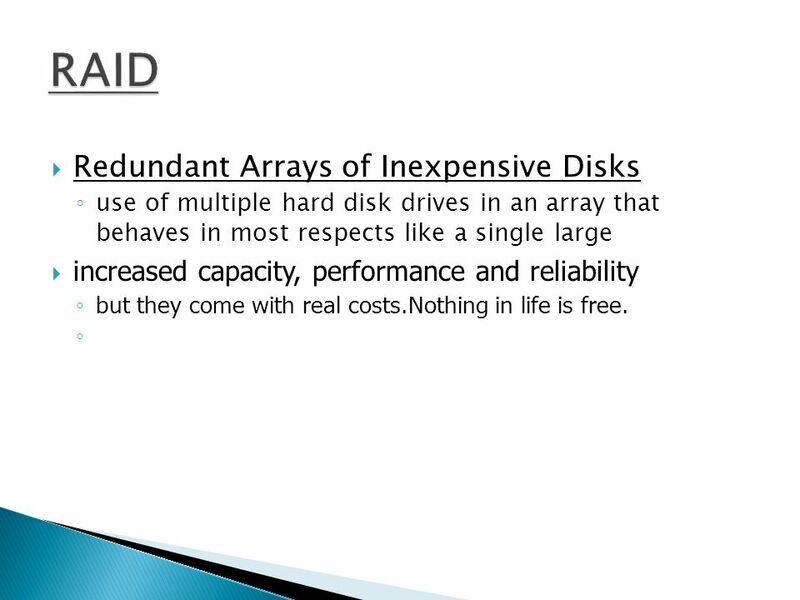 “Redundant Array of Inexpensive Disks”. CONTENTS Storage devices. Optical drives. Floppy disk. 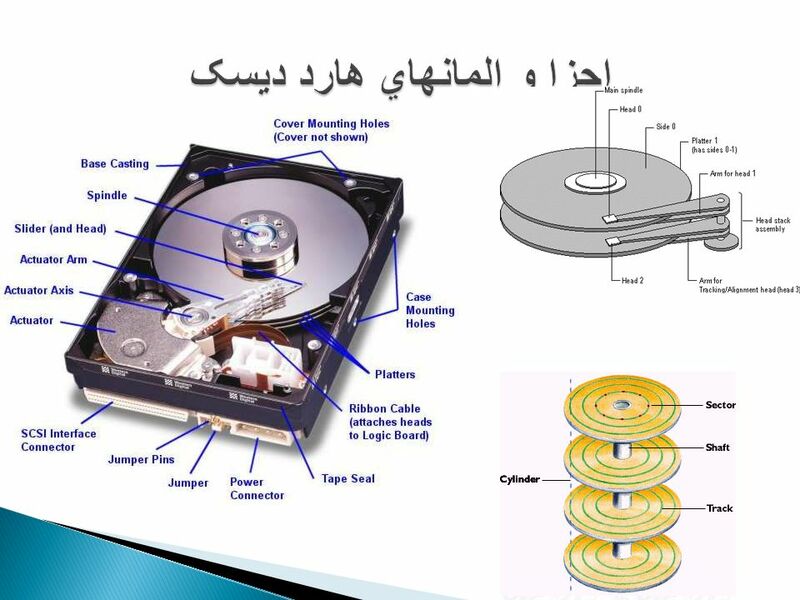 Hard disk. Components of Hard disks. RAID technology. Levels. 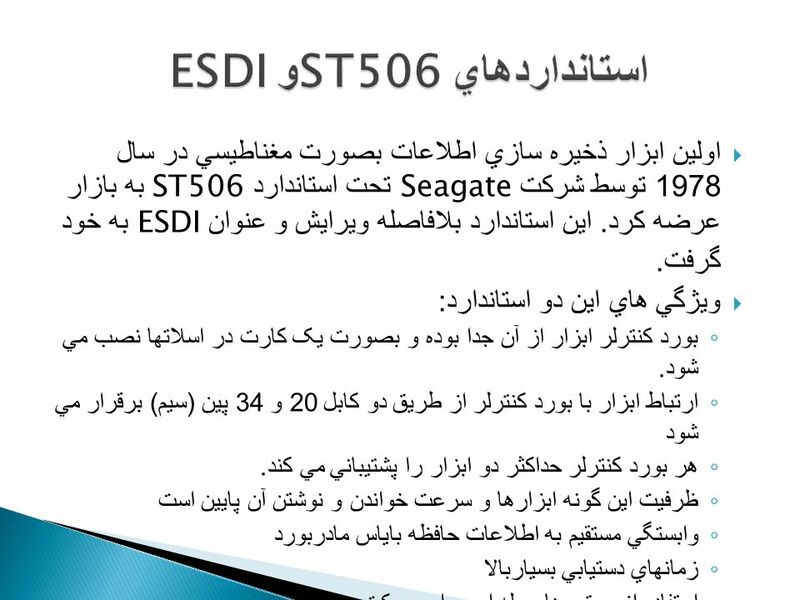 EET 450 – Advanced Digital Chapter 10 Hard Disk Drives. 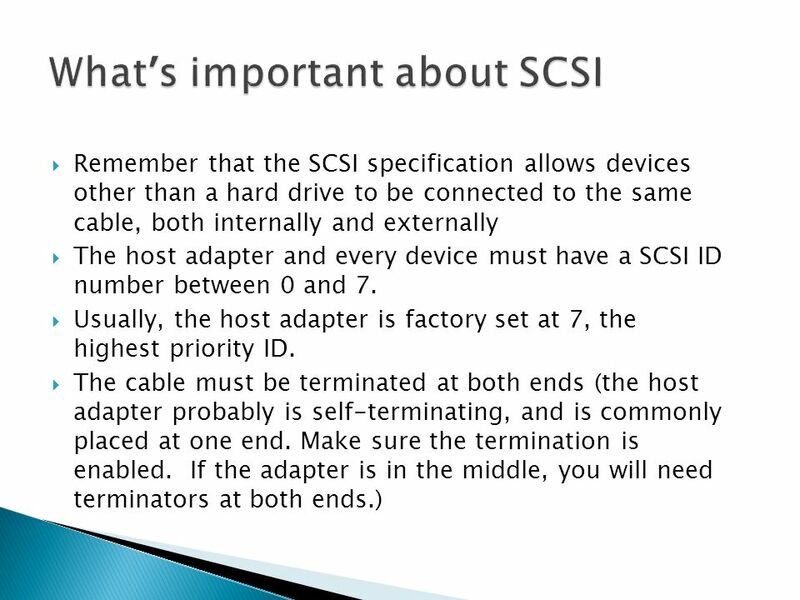 Chapter 22 All About SCSI. 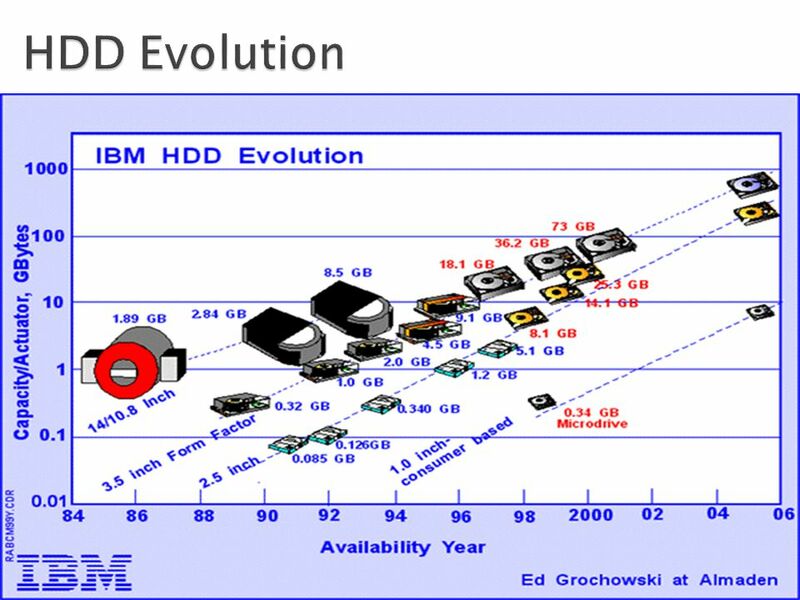 EET Advanced Digital Chapter 8 Mass Storage. 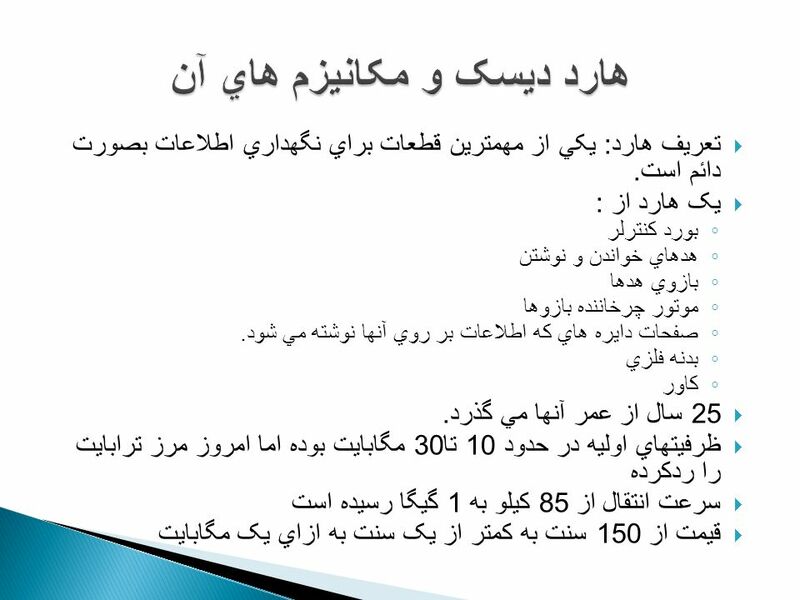 نام و نام خانوادگي : فريد ملازم 1 آزمايشکاه سيستم هاي هوشمند ( موضوع ارائه ارتباط بين component ها. 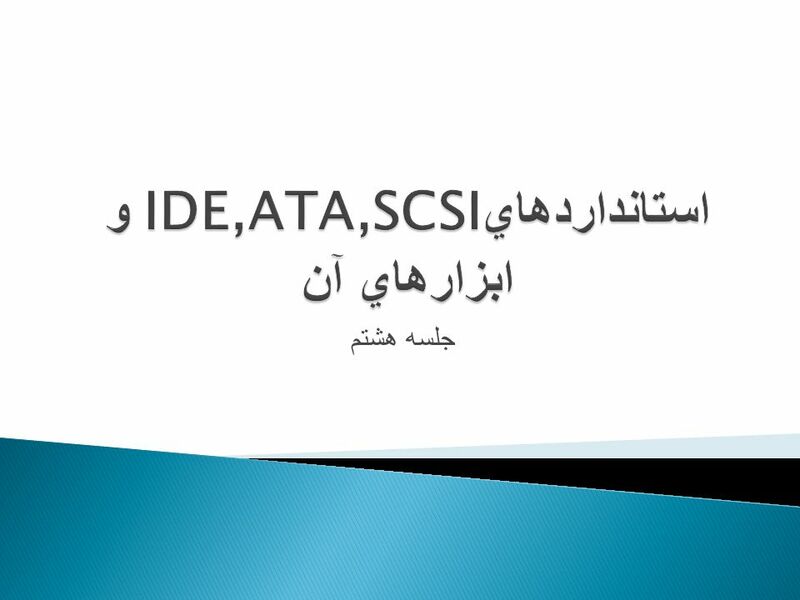 1 فصل 8 - طراحي زيرسيستم ها برگرفته از کتاب Large-Scale Software Architecture – Jeff Garland, Richard Anthony فرنوش گلشن آزمايشگاه سيستم هاي هوشمند بهار. نام و نام خانوادگي : فريد ملازم 1 آزمايشکاه سيستم هاي هوشمند ( موضوع ارائه Process and Deployment Design. تهيه كننده : علي برادران هاشمي گارگاه کامپیوتر Secondary Storage. 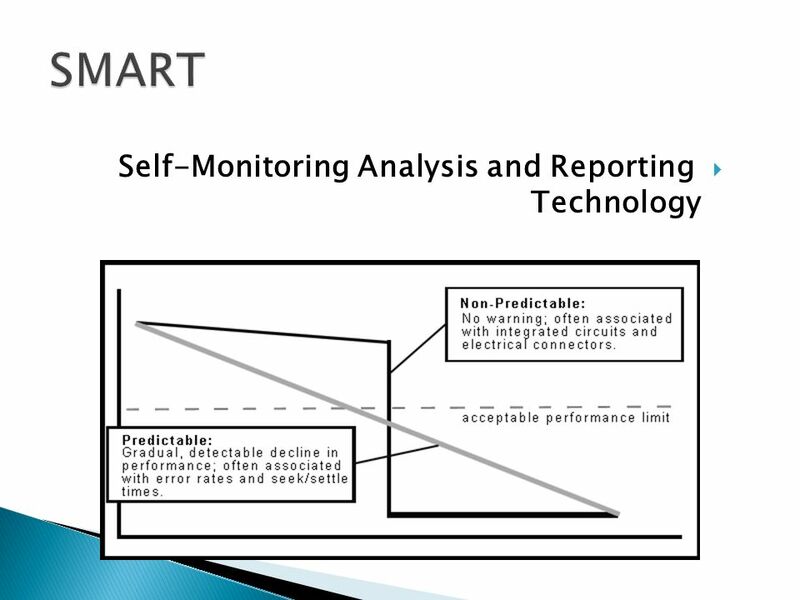 © 2007 The McGraw-Hill Companies, Inc. All rights reserved Hard Drive Technologies Chapter 9. مديريت پروژه‌هاي فناوري اطلاعات فرآيند مديريت پروژه-مرحله برنامه‌ريزي تخصيص منابع. مديريت پروژه‌هاي فناوري اطلاعات فرآيند مديريت پروژه-مرحله برنامه‌ريزي. IT Systems In and Out EN230-1 Justin Champion C208 – 3273 www.staffs.ac.uk/personel/engineering_and_technology/jjc1.